Abstract: Superparamagnetic iron oxide nanoparticles (SPIONs) are an exciting advancement in the field of nanotechnology. They expand the possibilities of noninvasive analysis and have many useful properties, making them potential candidates for numerous novel applications. Notably, they have been shown that they can be tracked by magnetic resonance imaging (MRI) and are capable of conjugation with various cell types, including stem cells. In-depth research has been undertaken to establish these benefits, so that a deeper level of understanding of stem cell migratory pathways and differentiation, tumor migration, and improved drug delivery can be achieved. Stem cells have the ability to treat and cure many debilitating diseases with limited side effects, but a main problem that arises is in the noninvasive tracking and analysis of these stem cells. Recently, researchers have acknowledged the use of SPIONs for this purpose and have set out to establish suitable protocols for coating and attachment, so as to bring MRI tracking of SPION-labeled stem cells into common practice. This review paper explains the manner in which SPIONs are produced, conjugated, and tracked using MRI, as well as a discussion on their limitations. A concise summary of recently researched magnetic particle coatings is provided, and the effects of SPIONs on stem cells are evaluated, while animal and human studies investigating the role of SPIONs in stem cell tracking will be explored. A popular form of high spatial resolution imaging used in stem cell studies is magnetic resonance imaging (MRI). It is non-ionizing, noninvasive, and has the ability to produce three-dimensional images. Increased accuracy in image analysis can be achieved by using contrast agents. A popular contrast agent is superparamagnetic iron oxide nanoparticles (SPIONs). SPIONs are small crystalline magnetite structures ranging in size from 5 nm to 150 nm9 which, when appropriately coated, become biocompatible and are readily endocytosed into the cell. They act as good contrast agents in MRI, enhancing the contrast between different tissues present by inducing a darker area (negative contrast). 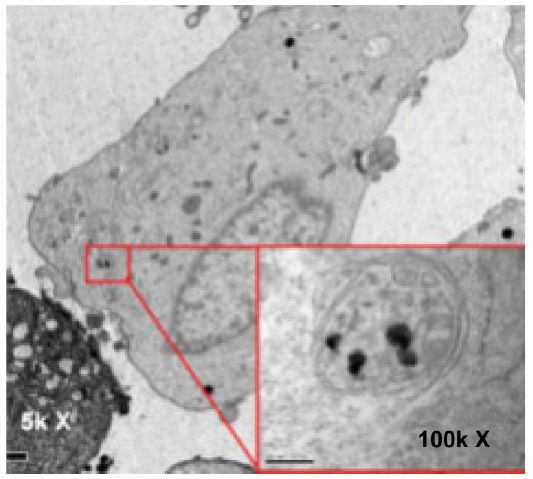 This is demonstrated in Figure 1, where 600 nm microgel iron oxide (M600) particles endocytosed into human fetal mesenchymal stem cells are imaged using transmission electron microscopy. With no cellular toxicity and a high sensitivity for MRI, M600 particles are a good candidate for use as a contrast agent in cell tracking using MRI. Additionally, SPIONs can be used for drug delivery and diagnostic purposes. Theoretically, SPIONs appear to be perfect for clinical use; however, their stability, biocompatibility,10 and ability to locate and label the cell11 must be controlled and enhanced. In this review, we explain the means of production of SPIONs and the different ways in which they are modified for specific stem cell tracking using MRI. We have also chosen to touch upon current research, both in animal and human studies that have utilized this technology, whilst discussing the potential limitations that exist. Figure 1 Magnetic nanoparticles imaged in the cytoplasm of a stem cell. What is a superparamagnetic iron oxide nanoparticle? SPIONs are a form of iron oxide nanoparticle that exhibit superparamagnetism,12 a property similar to paramagnetism where a material shows magnetic properties only when under the influence of an external magnetic field. When such a field is present, as is produced by an MRI machine, the magnetic moments of the nanoparticle align in the direction of the applied field. No permanent magnetism is observed, and once the magnetic field is removed, the magnetic moments of the nanoparticle returns to being randomized by Brownian motion. Superparamagnetism is a property that is favorable for imaging, as it provides a higher tendency for the material to align with an applied magnetic field and a higher magnetization of a material in response to the applied magnetic field.13 Several forms of iron oxide exist but, magnetite (Fe3O4) and maghemite (γ-Fe2O3) SPIONs are particularly common in the literature.14 Numerous studies have been conducted concerning these structures, leading to the development of many new possible applications and improvements on existing technology using SPIONs, particularly in the field of biomedicine. These ideas exploit the rare superparamagnetic properties displayed by SPIONs for imaging with MRI. SPIONs are effective contrast agents, owing to their superparamagnetic properties, high relaxivity,16 and high sensitivity in MRI, which leads to the use of very low concentrations, reducing their side effects.17 When SPIONs are present, they disturb the local magnetic field homogeneity and the large susceptibility differences between the iron oxide crystals and nearby protons, leading to a rapid dephasing of surrounding protons, resulting in a decrease in transverse (T2 and T2*)18 and translational (T1) relaxation times. The shorter transverse relaxation time, in particular, results in a darker image being observed in the vicinity of the SPIONs; this is referred to as negative contrast. SPIONs have been shown to be more efficient and longer lasting than many other agents, and they importantly exhibit long blood retention times, biodegradability, and low toxicity.19 The magnetic properties of SPIONs can be manipulated by controlling the size of their core and coatings.20 The basic morphology of a SPION is a single-domain iron oxide core that is <10 nm in size with a coating, which is most commonly dextran or a carboxy-dextran polymer. Nanoparticle aggregation can be prevented and biocompatibility improved by varying the nature of the coating applied to the core. The coating is thick compared to the core and is, therefore, the main contributor to the hydrodynamic size. The size of the particle will inevitably determine the overall chemical and physiological properties of the nanoparticle.21 A diagram of the basic structure of a magnetic nanoparticle (MNP) can be seen in Figure 2. 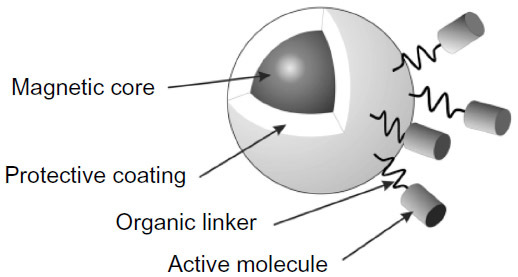 The figure details a magnetic core which, in the context of this article, is comprised of iron oxide, a protective coating, and active molecules, bound to the coating by organic linkers. Bound active molecules (a form of surface modification) are used to tailor the nanoparticle for specific applications. Figure 2 A basic schematic diagram of a magnetic nanoparticle’s structure. Figure 3 Magnetic resonance image of rats with neurodegenerative disease injected by mesenchymal stem cells labeled with magnetic nanoparticles. The future for the use of SPIONs in stem cell tracking is hopeful. In theory, information gained from stem cell tracking could lead to optimized dosages, preferred sites of engraftment, and specialized timing of stem cell injections,26 allowing for the tailoring of treatments to individual patients. the limitations involved in SPION stem cell tracking. In this review, we will cover these topics, providing a clear understanding of the processes involved in stem cell tracking using SPIONs. Many different chemical methods for synthesizing MNPs are available, including thermal decomposition, hyperthermal, coprecipitation, solvo–thermal route, and sol–gel methods. Most commonly used is the precipitation-based approach, which is achieved either by coprecipitation or reverse micelle synthesis. This is shown in Table 1, which outlines the various research groups who showed that decomposition methods can produce MNPs with more favorable magnetic properties when compared to those formed by coprecipitation. The choice of the core of the MNP is an important factor when producing MNPs. The majority of the studies detailed in Table 1 use iron oxide, due to its biocompatibility and low toxicity. Iron oxide nanoparticles without a surface coating are not viable in aqueous medium and, therefore, will readily aggregate and precipitate. Abbreviations: NR, not reported; TEM, transmission electron microscopy; XRD, X-ray diffraction; PEG, polyethylene glycol; DLS, dynamic light scattering; FTIR, Fourier transform infrared spectroscopy; γ-PGA, poly(γ-glutamic acid); HA, humic acid; MNPs, magnetic nanoparticles; AFM, atomic force microscopy. Abbreviations: MNPs, magnetic nanoparticles; MRI, magnetic resonance imaging; SPIONs, superparamagnetic nanoparticles; PLL, poly-L-lysine; MSC, mesenchymal cells; NR, not reported; USPIO-PS, ultrasmall superparamagnetic iron oxide; hADSCs, human adipose-derived stem cells; FE-PRO, ?? ; hB, ?? ; CoPt, ?? ; PEG-SH, ?? ; CCALNN, ?? ; NSC, neural stem cells; SPIO, superparamagnetic iron oxide; hBM, ?? ; MGIO, microgel iron oxide; PMG, precursor microgel; hfMSC, human fetal mesenchymal cells. Attaching the nanoparticle to the surface of the stem cell. Internalizing the biocompatible SPION by endocytosis or phagocytosis. It is important to note that the first method, surface labeling, is limited to in vitro settings, as the method is generally unsuitable for use in vivo models due to clearance of the labeled cells from rapid reticuloendothelial recognition.29 In the internalization method, the SPION can enter the cell via either receptor-mediated interactions or nonspecific internalization pathways. The success of labeling stem cells with SPIONs is usually advanced by encasing the nanoparticle in a biocompatible coating. The correct choice of coating will ensure stability, solubility, and prevent aggregation of the SPIONs. Often a transfection agent is used, which promotes a quicker and significantly more efficient uptake of the label into the cell. Some common examples are poly-L-lysine (PLL), sulfate, and protamine.27 It is important to not only choose the correct coating, but also to use the correct concentration of the transfection agent. This is highlighted in Figure 4, in which protamine is used as a transfection agent for the MNP, Feridex. At a low concentration (1 μg/mL) of protamine, a lower percentage of mesenchymal stem cells are labeled than at the recommended concentration of protamine (5 μg/mL), in which 95% of the cells are labeled. After a transfection agent has been applied, the nanoparticles are incubated overnight in the appropriate stem cell medium, which facilitates a passive uptake of the nanoparticles. Notable and interesting exceptions are epithelial cell adhesion molecule beads, which utilize antigens that are specifically present on the human hepatic stem cells. Exterior attachment of the label is achieved by specific antibodies manufactured on the surface of the nanoparticle, which are complimentary to the antigen on the human hepatic stem cells. The usual process of passive uptake is often close to being 100% successful, meaning that in general, the labels are evaluated by the effect that they have on stem cells, their relaxivity, and the time in which they remain detectable by MRI. Figure 4 Application of transfection agents to encourage a swift uptake of magnetic nanoparticles by stem cells. A wide array of different nanoparticles and coatings has been reported in the literature with impressive results. For the most part, ferumoxide, ferucarbotran, and Feridex SPIONs coated with different materials (such as dextran and carboxydextran) are used, as they are approved for human use. A specific example of human use is shown in Figure 5, in which neural stem cells are labeled by the nanoparticle, Feridex, which is coupled to the transfection reagent, Effectene® (Qiagen, Venlo, the Netherlands). A lesion in the left temporal lobe is highlighted with an asterisk and no signal is seen (Figure 5A) on the MRI image before the implantation of the labeled stem cell. One day later, implantation signals were observed (Figure 5B), indicating the presence of the labeled neural stem cells at the legion site. 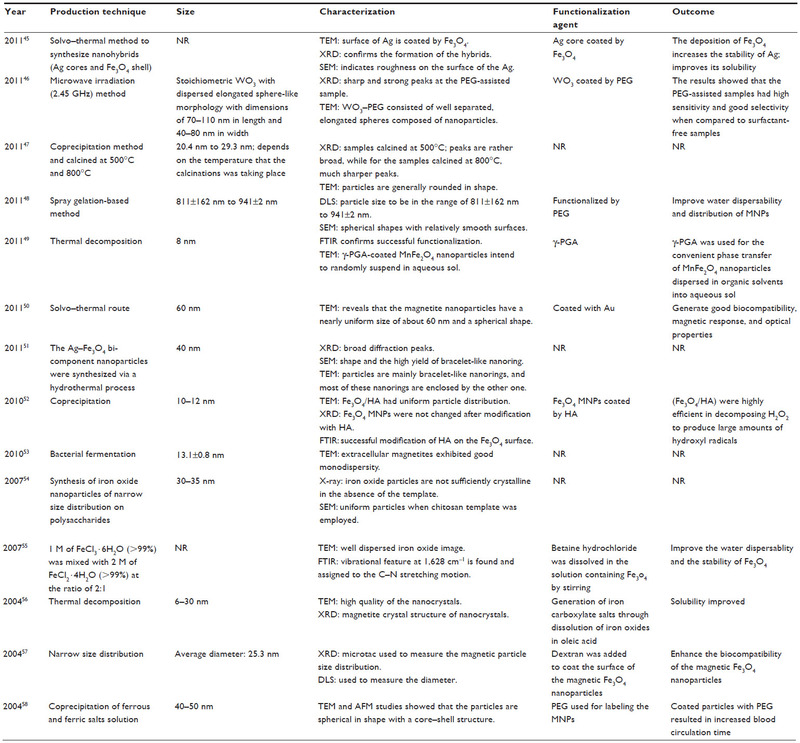 A clear, concise summary of the effect of some commonly used magnetic nanoparticles is given in Table 2. The method of labeling, the percentage of the cells labeled, how long the label remains in the cell, and the effect of the presence of the label in the cell is detailed. Other nanoparticles have been tested and evaluated as MRI contrast agents (for example, gold, MnO, and CoPt); however the sheer volume of literature available regarding coated SPIONs confirms their superiority as a contrast agent in the field of stem cell tracking. Figure 5 Magnetic resonance imaging scan of the damaged temporal lobe of a human that received neural stem cells labeled with magnetic nanoparticles. The in vivo tracking of stem cells using SPIONs has already been extensively studied in various animal models. Jing et al,30 using the Feridex–protamine sulfate complex as the SPION, as well as transfection agents, tracked mesenchymal stem cells in the articular cartilage within the knee joints of rabbits. The study showed that there were no changes in the viability, proliferation, or differentiation of the labeled stem cells in comparison to the non-labeled cells when examined at a concentration of 25 ⪳when Once the labeled stem cells were intra-articularly injected, upon gradient echo sequence–T2 weighted signals, areas of hypointense signals could be seen on imaging and were apparent for at least 12 weeks after the initial injection. Comparable results were also seen in a study by Hu et al,31 in which human umbilical cord mesenchymal stem cells were transplanted surgically into the spinal cord of an adult rat. Once again, the researchers used Feridex coating for the SPION, at 22.4 coating for the SPION on a gradient echo sequence–T2 weighted MRI, there was a markedly hypointense area in the region transplanted with SPION-labeled human umbilical cord mesenchymal stem cells and, more importantly, that the transplanted labeled cells were found to be more hypointense than non-labeled cells. It was also determined that the stem cells were accurately detectable 2 weeks after the initial transplant. It is, furthermore, important to note that both Jing et al30 and Hu et al31 identified that the extent of the signal intensity changes expressed by SPION-labeled stem cells was dependent on the number of labeled stem cells at any one time, and that this number could decrease significantly over time. The role of stem cells in myocardial repair following myocardial infarction or insult has yet been established. A study by Amsalem et al32 used SPIONs, coated with ferumoxide and complexed to PLL, to track MSC after being injected into the rats, 7 days after inducing a myocardial infarction. The authors found that after 1 week, 2 weeks, and 4 weeks, the MRI demonstrated well-defined hypointense areas in the rats that were injected with SPION-labeled MSCs, while control specimens injected with saline or unlabeled MSCs showed no areas of hypointensities. There was retention of the magnetic signal throughout the 4-week period, and this was comparable among both groups of rats (those that had suffered a myocardial infarction, and those that had not). Another group of researchers, Chapon et al,33 used dextran-coated SPIONs to track bone marrow-derived mesenchymal stem cells to determine their effect in host cardiac tissue after a myocardial infarction. It was shown that the SPION-labeled stem cells could be tracked for up to 6 weeks after the initial stem cell injection using MRI. In addition, the study also demonstrated that there was a larger uptake of stem cells in infarcted tissue, as shown by the positron emission tomography study, in which radiolabeled glucose (2-deoxy-2-[F-18] fluoro-D-glucose [FDG]) was used to determine glucose uptake of the cells at the infarcted areas. While the study showed that despite the increased uptake of bone marrow-derived mesenchymal stem cells in the infarcted areas there was no improved left ventricular function in the rats, it did highlight the ability to track the stem cells. Although promising, some limitations and questions arose from the research concerning the best medium and cell surface coating to use in order to optimize stem cell tracking, and as such, further in vivo work would need to be conducted. for 48 hours with a 50 a 50s for 48 hours with a 50ith a 50n done in vivo to this ennge in the morphology or viability of the rMSCs. However, it was established that in vivo, the rMSCs did not respond to the subventricular zone environment and transdifferentiate, while it did not migrate towards the olfactory bulb unless a mechanical lesion was performed at the olfactory bulb site. At this point, it was discovered that by using an MRI, there was a long distance of migration in rMSC from the subventricular zone to the olfactory bulb via the rostral migratory system. The value of the research conducted by Delcroix et al34 demonstrated for the first time that neural migratory pathways can be established and mapped out using SPIONs. The importance of identifying stem cell migratory mechanisms in response to injury could eventually lead to the use of MSCs in brain cell therapy, and it further establishes that additional research is required as to why, despite in vitro models suggesting that transdifferentiation of MSCs into neural cells, this is not the case in vivo. There is considerable promise and established research that demonstrates that SPIONs have an exciting role in stem cell tracking by non-invasive mechanisms which could, in time, lead to deeper appreciation of tissue regeneration pathways and future clinical applications. There is a great potential role for the in vivo, non-invasive tracking of transplanted human stem cells, as there is scope for obtaining real-time insights into underlying physiological and cellular responses of stem cells in both normal functioning and pathological injury. As was discussed with the animal studies, understanding migratory pathways and the manner in which different stem cells differentiate to site-specific cells can be crucial in the development of clinical therapies. In order for long-term clinical therapies to be introduced, there is a necessary evolution in research that has to occur, as animal models need to progress to human models before clinical trials can take place. et a SPION.36 They confirmed that the dendritic cells had taken up a significant amount of SPIONs before the end of the culture period, verified the phenotype of the cells were the same as the non-labeled cells, and finally established that there was no change in the functionality of the cells after the culture. 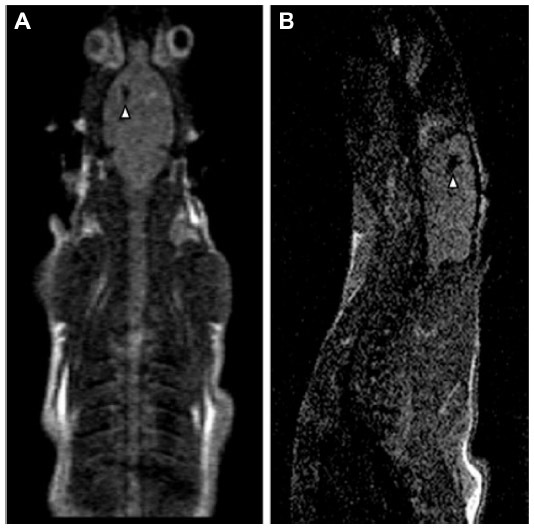 Following intranodal injection into eight grade 3 melanoma patients, 3T MRI along with scintigraphy was used to image the injected cells. The results showed that MRI imaging was at least as sensitive an imaging modality as scintigraphy, and it also managed to track the cells with a higher degree of accuracy due to its superior spatial resolution. Vries et al noted in their work that 50% of the ultrasound-guided injections of stem cells were misadministered into nodes adjacent to the target lymph node and, importantly, this was only revealed on subsequent MRI imaging. Identifying this error, however, showed that SPION-labeled cells could be tracked using MRI, and they could also be used to ensure that cells are injected or delivered to the correct target site. In 2008, Zhu et al37 conducted a case study on two patients: one of which was a 34-year-old man who had brain trauma in his left temporal lobe in 2004; and a control 42-year-old male who had brain trauma in his right temporal lobe. Neural tissue from both patients was taken during emergency operations, and the test patient had his neural tissue incubated with Feridex SPIONs and a lipofection transfection agent.37 The SPION-labeled neural stem cells were then injected around the region of the brain damage and 3T MRI was performed at 24 hours, then every 7 days after transplantation for 10 weeks. Before implantation, upon T2 weighted MRI imaging, no pronounced hypointense signals were found, although the injection sites themselves produced a circular area of dark tissue on imaging. This hypointense signal at the injection sites faded after a week or so. In terms of the injected cells themselves, a hypointense signal was seen around the border of the damaged tissue in the temporal lobe, and it intensified at around weeks 2 and 3, before eventually fading after 7 weeks, most likely due to dilution of the SPIONs in response to cell proliferation around the site of the lesion. In the control patient, however, there was no change in the signal on MRI during the observation over the trial period, although there was a slight hypointense signal at the injection sites. The researchers concluded that stem cell migration after implantation could indeed be detected via non-invasive methods using SPIONs and MRI. As of yet, not many human subject studies have been done using SPIONs, but even from the brief research that has been conducted, there seems to be legitimate and effective results showing the promising use of SPIONs in stem cell tracking using non-invasive mechanisms, such as MRI. Of course, dependent on the progress of work in animal models, human studies can progress. Much will still need to be done to obviate the use of transfection agents, which may be attributed to cell death, and to assess the most appropriate and suitable method of labeling stem cells. As such, with promising initial results, there is a certain scope for advancement. The limitations of MRI are well illustrated in their use of stem cell tracking. First, due to cell division, the SPION-labeled cells become diluted in a localized site and, consequently, the generated image is weakened or distorted. This has been seen in neural stem cells where the concentration of SPIONs was shown to decrease by 50% every 3 days in vitro. Second, due to the in vivo migration of SPION-labeled stem cells, the density of the cells is considerably reduced over time, again leading to a weakening of the MRI signal.23 Third, SPION cell labeling itself cannot determine if or what the SPION-labeled stem cell differentiates into, although through the use of combined imaging techniques such as immunohistochemistry and confocal microscopy, the function of the stem cell can be ascertained.38 Fourth, most studies utilizing MRI are conducted with a 1.5T MRI unit, which has a limited spatial resolution and does not allow for deep imaging. An improvement in spatial resolution can only be achieved through the use of stronger magnetic fields, and it is still unknown what effect this would have upon an organism and the associated hazards.39 Fifth, SPIONs are not detected directly; rather, they are detected through indirect microscopic disturbances in the magnetic field. As a result of this, it proves harder to correlate the magnetic resonance signal with the number of cells present.40 Another commonly encountered problem is that if cells die, they will still be imaged by MRI, as the SPIONs will remain inside or attached to the cell. This invariably leads to an inaccurate analysis of the MRI image, especially since it is likely that these dead cells are engulfed by macrophages, which would lead to contrast agents being present in the lymph nodes. SPIONs come with an inherent risk of toxicity, as is the case with any foreign particle or chemical that is injected or administered within an organism. SPIONs are composed of biodegradable iron, which could potentially be recycled by cells within the body that use biochemical pathways for iron metabolism. This would lead to a situation of iron-mediated toxicity, which includes the synthesis of iron-catalyzed reactive oxygen species.41 The cytotoxicity of SPIONs has been explored in human mesenchymal stem cells,39 mouse embryonic stem cells,22 and neural stem cells42,43 by a variety of researchers. It was discovered that on the whole, the internalization of the nanoparticle into these stem cells did not affect cell growth or differentiation or, indeed, its viability to survive. However, there has been evidence to suggest that endocytic lifecycles can be affected due to nanoparticles residing in endosomes.42 Studies were undertaken, which showed that it is the iron itself within the SPION that caused impairment in chondrogenic differentiation, as opposed to any transfection factors that were present;43 however, other research shows that it is the transfection agent, PLL, that causes this effect on differentiation (for more toxicity information, see Table 2). SPIONs, much like with all branches of nanotechnology and nanomedicine, confer an exciting prospect for nanoscale changes and manipulation of particles to allow for ground breaking research or therapeutic achievements; however, it is important that with this ability to manipulate size, shape, charge, or surface modification, there is the scope to introduce two factors, leading to further toxicity and cell damage, or poor viability, for SPIONs. For example, Mahmoudi et al44 changed the configuration of SPIONs into different shapes such as spheres, nanoworms, rod shapes, and beads for different functional benefits. The authors found that when they exposed mouse L929 fibroblast cells, there was increased toxicity, despite being at the same molarity as other configurations in the cells exposed to nanobeads, nanoworms, and nanospheres. This helps to highlight different physicochemical properties such as final size, shape, and charge, which will affect the viability of SPIONs. As such, it is imperative that further purpose-specific toxicity testing is undertaken to assess SPION toxicity and to truly appreciate that new SPION modifications themselves can lead to new toxicity considerations. Stem cell therapy has boundless scope and prospects for therapeutic and clinical use. In this review, we have focused on stem cell tracking using SPIONs. We have discussed and evaluated the way in which SPIONS are synthesized, coated, and targeted for the use in stem cell tracking. Further to this, we have evaluated and discussed the current research published pertaining to stem cell tracking in both animal and human studies. Researchers across the globe are continuously working on ways to improve the techniques already in place, and to invent ways to combat limitations. It is, however, a new technology that requires further research and understanding. Many different types of peptides and different chemical coatings can be conjugated with SPIONs, and greater insights and understandings of the complex mechanisms that govern human functions are required to maximize the potential of the coatings. It is also still not fully clear which cytotoxic and hazardous effects the nanoparticles induce; consequentially, it will take time to allow them to be used in a clinical scenario. A greater understanding of the methods and strategies used to produce SPIONs with greater specificity and sensitivity are also needed. In summary, much work is still required in order to bring SPIONs into a clinical environment. Our understanding of many of the physiological mechanisms in the body has improved, our knowledge concerning the biology of stem cells has increased, and if research continues effectively, there is no doubt that nanoparticles, including SPIONS, will revolutionize clinical medicine. Becker AJ, McCulloch EA, Till JE. Cytological demonstration of the clonal nature of spleen colonies derived from transplanted mouse marrow cells. Nature. 1963;197:452–454. Ghanbari H, de Mel A, Seifalian AM. Cardiovascular application of polyhedral oligomeric silsesquioxane nanomaterials: a glimpse into prospective horizons. Int J Nanomedicine. 2011;6:775–786. Deans RJ, Moseley AB. Mesenchymal stem cells: biology and potential clinical uses. Exp Hematol. 2000;28(8):875–884. de Mel A, Murad F, Seifalian AM. Nitric oxide: a guardian for vascular grafts? Chem Rev. 2011;111(9):5742–5767. Bang OY, Lee JS, Lee PH, Lee G. Autologous mesenchymal stem cell transplantation in stroke patients. Ann Neurol. 2005;57(6):874–882. Horwitz EM, Prockop DJ, Gordon PL, et al. Clinical responses to bone marrow transplantation in children with severe osteogenesis imperfecta. Blood. 2001;97(5):1227–1231. Callera F, de Melo CM. Magnetic resonance tracking of magnetically labeled autologous bone marrow CD34+ cells transplanted into the spinal cord via lumbar puncture technique in patients with chronic spinal cord injury: CD34+ cells’ migration into the injured site. Stem Cells Dev. 2007;16(3):461–466. Wollert KC, Meyer GP, Lotz J, et al. Intracoronary autologous bone-marrow cell transfer after myocardial infarction: the BOOST randomised controlled clinical trial. Lancet. 2004;364(9429):141–148. Madani SY, Naderi N, Dissanayake O, Tan A, Seifalian AM. A new era of cancer treatment: carbon nanotubes as drug delivery tools. Int J Nanomedicine. 2011;6:2963–2979. Tan A, Yildirimer L, Rajadas J, De La Peña H, Pastorin G, Seifalian A. Quantum dots and carbon nanotubes in oncology: a review on emerging theranostic applications in nanomedicine. Nanomedicine (Lond). 2011;6(6):1101–1114. LaConte L, Nitin N, Bao G. Magnetic nanoparticle probes. Mater Today. 2005;8(5 Suppl 1):32–38. Reimer P, Balzer T. Ferucarbotran (Resovist): a new clinically approved RES-specific contrast agent for contrast-enhanced MRI of the liver: properties, clinical development, and applications. Eur Radiol. 2003;13(6):1266–1276. Neuberger T, Schöpf B, Hofmann H, Hofmann M, von Rechenberg B. Superparamagnetic nanoparticles for biomedical applications: possibilities and limitations of a new drug delivery system. J Magn Magn Mater. 2005;293(1):483–496. Lai CH, Yen TC, Ng KK. Molecular imaging in the management of cervical cancer. J Formos Med Assoc. 2012;111(8):412–420. Lin MM, Kim do K, El Haj AJ, Dobson J. Development of superparamagnetic iron oxide nanoparticles (SPIONS) for translation to clinical applications. IEEE Trans Nanobioscience. 2008;7(4):298–305. Gindy ME, Prud’homme RK. Multifunctional nanoparticles for imaging, delivery and targeting in cancer therapy. Expert Opin Drug Deliv. 2009;6(8):865–878. Rice HE, Hsu EW, Sheng H, et al. Superparamagnetic iron oxide labeling and transplantation of adipose-derived stem cells in middle cerebral artery occlusion-injured mice. AJR Am J Roentgenol. 2007;188(4):1101–1108. Harisinghani MG, Barentsz J, Hahn PF, et al. Noninvasive detection of clinically occult lymph-node metastases in prostate cancer. N Engl J Med. 2003;348(25):2491–2499. Rogers WJ, Basu P. Factors regulating macrophage endocytosis of nanoparticles: implications for targeted magnetic resonance plaque imaging. Atherosclerosis. 2005;178(1):67–73. Jung CW, Jacobs P. Physical and chemical properties of superparamagnetic iron oxide MR contrast agents: ferumoxides, ferumoxtran, ferumoxsil. Magn Reson Imaging. 1995;13(5):661–674. Arai T, Kofidis T, Bulte JW, et al. Dual in vivo magnetic resonance evaluation of magnetically labeled mouse embryonic stem cells and cardiac function at 1.5 t. Magn Reson Med. 2006;55(1):203–209. Guzman R, Uchida N, Bliss TM, et al. Long-term monitoring of transplanted human neural stem cells in developmental and pathological contexts with MRI. Proc Natl Acad Sci U S A. 2007;104(24):10211–10216. Higuchi T, Anton M, Dumler K, et al. Combined reporter gene PET and iron oxide MRI for monitoring survival and localization of transplanted cells in the rat heart. J Nucl Med. 2009;50(7):1088–1094. Welling MM, Duijvestein M, Signore A, van der Weerd L. In vivo biodistribution of stem cells using molecular nuclear medicine imaging. J Cell Physiol. 2011;226(6):1444–1452. Berry CC, Wells S, Charles S, Aitchison G, Curtis AS. Cell response to dextran-derivatised iron oxide nanoparticles post internalisation. Biomaterials. 2004;25(23):5405–5413. Jasmin, Torres AL, Jelicks L, de Carvalho AC, Spray DC, Mendez-Otero R. Labeling stem cells with superparamagnetic iron oxide nanoparticles: analysis of the labeling efficacy by microscopy and magnetic resonance imaging. Methods Mol Biol. 2012;906:239–252. De Cuyper M, Joniau M. Magnetoliposomes. Formation and structural characterization. Eur Biophys J. 1988;15(5):311–319. Syková E, Jendelová P. Magnetic resonance tracking of implanted adult and embryonic stem cells in injured brain and spinal cord. Ann N Y Acad Sci. 2005;1049:146–160. Jing XH, Yang L, Duan XJ, et al. In vivo MR imaging tracking of magnetic iron oxide nanoparticle labeled, engineered, autologous bone marrow mesenchymal stem cells following intra-articular injection. Joint Bone Spine. 2008;75(4):432–438. Hu SL, Lu PG, Zhang LJ, et al. In vivo magnetic resonance imaging tracking of SPIO-labeled human umbilical cord mesenchymal stem cells. J Cell Biochem. 2012;113(3):1005–1012. Amsalem Y, Mardor Y, Feinberg MS, et al. Iron-oxide labeling and outcome of transplanted mesenchymal stem cells in the infarcted myocardium. Circulation. 2007;116(Suppl 11):I38–I45. Chapon C, Jackson JS, Aboagye EO, Herlihy AH, Jones WA, Bhakoo KK. An in vivo multimodal imaging study using MRI and PET of stem cell transplantation after myocardial infarction in rats. Mol Imaging Biol. 2009;11(1):31–38. Delcroix GJ, Jacquart M, Lemaire L, et al. Mesenchymal and neural stem cells labeled with HEDP-coated SPIO nanoparticles: in vitro characterization and migration potential in rat brain. Brain Res. 2009;1255:18–31. Mahmoudi M, Hosseinkhani H, Hosseinkhani M, et al. Magnetic resonance imaging tracking of stem cells in vivo using iron oxide nanoparticles as a tool for the advancement of clinical regenerative medicine. Chem Rev. 2011;111(2):253–280. de Vries IJ, Lesterhuis WJ, Barentsz JO, et al. Magnetic resonance tracking of dendritic cells in melanoma patients for monitoring of cellular therapy. Nat Biotechnol. 2005;23(11):1407–1413. Zhu J, Zhou L, XingWu F. Tracking neural stem cells in patients with brain trauma. N Engl J Med. 2006;355(22):2376–2378. Arbab AS, Pandit SD, Anderson SA, et al. Magnetic resonance imaging and confocal microscopy studies of magnetically labeled endothelial progenitor cells trafficking to sites of tumor angiogenesis. Stem Cells. 2006;24(3):671–678. Hsiao JK, Tai MF, Chu HH, et al. Magnetic nanoparticle labeling of mesenchymal stem cells without transfection agent: cellular behavior and capability of detection with clinical 1.5 T magnetic resonance at the single cell level. Magn Reson Med. 2007;58(4):717–724. Bulte JW. Hot spot MRI emerges from the background. Nat Biotechnol. 2005;23(8):945–946. Hoepken HH, Korten T, Robinson SR, Dringen R. Iron accumulation, iron-mediated toxicity and altered levels of ferritin and transferrin receptor in cultured astrocytes during incubation with ferric ammonium citrate. J Neurochem. 2004;88(5):1194–1202. Arbab AS, Wilson LB, Ashari P, Jordan EK, Lewis BK, Frank JA. A model of lysosomal metabolism of dextran coated superparamagnetic iron oxide (SPIO) nanoparticles: implications for cellular magnetic resonance imaging. NMR Biomed. 2005;18(6):383–389. Bulte JW, Kraitchman DL, Mackay AM, Pittenger MF. Chondrogenic differentiation of mesenchymal stem cells is inhibited after magnetic labeling with ferumoxides. Blood. 2004;104(10):3410–3412; author reply 3412. Mahmoudi M, Simchi A, Imani M, et al. A new approach for the in vitro identification of the cytotoxicity of superparamagnetic iron oxide nanoparticles. Colloids Surf B Biointerfaces. 2010;75(1):300–309. Zhai Y, Han L, Wang P, et al. Superparamagnetic plasmonic nanohybrids: shape-controlled synthesis, TEM-induced structure evolution, and efficient sunlight-driven inactivation of bacteria. ACS Nano. 2011;5(11):8562–8570. Hariharan V, Radhakrishnan S, Parthibavarman M, Dhilipkumar R, Sekar C. Synthesis of polyethylene glycol (PEG) assisted tungsten oxide (WO3) nanoparticles for L-dopa bio-sensing applications. Talanta. 2011;85(4):2166–2174. Yaseneva P, Bowker M, Hutchings G. Structural and magnetic properties of Zn-substituted cobalt ferrites prepared by co-precipitation method. Phys Chem Chem Phys. 2011;13(41):18609–18614. El-Sherbiny IM, Smyth HD. Smart magnetically responsive hydrogel nanoparticles prepared by a novel aerosol-assisted method for biomedical and drug delivery applications. J Nanomater. 2011; 2011(2011):1–13. Kim HM, Lee H, Hong KS, et al. Synthesis and high performance of magnetofluorescent polyelectrolyte nanocomposites as MR/near- infrared multimodal cellular imaging nanoprobes. ACS Nano. 2011;5(10):8230–8240. Ren J, Shen S, Pang Z, Lu X, Deng C, Jiang X. Facile synthesis of superparamagnetic Fe3O4@Au nanoparticles for photothermal destruction of cancer cells. Chem Commun (Camb). 2011;47(42):11692–11694. Zhou S, Chen Q. Synthesis and characterization of bracelet-like magnetic nanorings consisting of Ag-Fe3O4 bi-component nanoparticles. Dalton Trans. 2011;40(34):8622–8629. Niu H, Zhang D, Zhang S, Zhang X, Meng Z, Cai Y. Humic acid coated Fe3O4 magnetic nanoparticles as highly efficient Fenton-like catalyst for complete mineralization of sulfathiazole. J Hazard Mater. 2011;190(1–3):559–565. Moon JW, Rawn CJ, Rondinone AJ, et al. Large-scale production of magnetic nanoparticles using bacterial fermentation. J Ind Microbiol Biotechnol. 2010;37(10):1023–1031. Nidhin M, Indumathy R, Sreeram KJ, Nair BU. Synthesis of iron oxide nanoparticles of narrow size distribution on polysaccharide templates. Bulletin of Material Science. 2008;31(1):93–96. Du L, Chen J, Qi Y, et al. Preparation and biomedical application of a non-polymer coated superparamagnetic nanoparticle. Int J Nanomedicine. 2007;2(4):805–812. Yu WW, Falkner JC, Yavuz CT, Colvin VL. Synthesis of monodisperse iron oxide nanocrystals by thermal decomposition of iron carboxylate salts. Chem Commun (Camb). 2004;(20):2306–2307. Jiang W, Yang HC, Yang SY, et al. Preparation and properties of superparamagnetic nanoparticles with narrow size distribution and biocompatible. J Magn Magn Mater. 2004;283(2–3):210–214. Gupta AK, Wells S. Surface-modified superparamagnetic nanoparticles for drug delivery: preparation, characterization, and cytotoxicity studies. IEEE Trans Nanobioscience. 2004;3(1):66–73. Ricles LM, Nam SY, Sokolov K, Emelianov SY, Suggs LJ. Function of mesenchymal stem cells following loading of gold nanotracers. Int J Nanomedicine. 2011;6:407–416. Lalande C, Miraux S, Derkaoui SM, et al. Magnetic resonance imaging tracking of human adipose derived stromal cells within three-dimensional scaffolds for bone tissue engineering. Eur Cell Mater. 2011;21:341–354. McClelland R, Wauthier E, Tallheden T, Reid LM, Hsu E. In situ labeling and magnetic resonance imaging of transplanted human hepatic stem cells. Mol Imaging Biol. 2011;13(5):911–922. van Buul GM, Kotek G, Wielopolski PA, et al. Clinically translatable cell tracking and quantification by MRI in cartilage repair using superparamagnetic iron oxides. PLoS One. 2011;6(2):e17001. Kim T, Momin E, Choi J, et al. Mesoporous silica-coated hollow manganese oxide nanoparticles as positive T1 contrast agents for labeling and MRI tracking of adipose-derived mesenchymal stem cells. J Am Chem Soc. 2011;133(9):2955–2961. Meng X, Seton HC, Lu le T, Prior IA, Thanh NT, Song B. Magnetic CoPt nanoparticles as MRI contrast agent for transplanted neural stem cells detection. Nanoscale. 2011;3(3):977–984. Henning TD, Sutton EJ, Kim A, et al. The influence of ferucarbotran on the chondrogenesis of human mesenchymal stem cells. Contrast Media Mol Imaging. 2009;4(4):165–173. Wang HH, Wang YX, Leung KC, et al. Durable mesenchymal stem cell labelling by using polyhedral superparamagnetic iron oxide nanoparticles. Chemistry. 2009;15(45):12417–12425. Loebinger MR, Kyrtatos PG, Turmaine M, et al. Magnetic resonance imaging of mesenchymal stem cells homing to pulmonary metastases using biocompatible magnetic nanoparticles. Cancer Res. 2009;69(23):8862–8867. McBain SC, Yiu HH, Dobson J. Magnetic nanoparticles for gene and drug delivery. Int J Nanomedicine. 2008;3(2):169–180. Moraes L, Vasconcelos-dos-Santos A, Santana FC, et al. Neuroprotective effects and magnetic resonance imaging of mesenchymal stem cells labeled with SPION in a rat model of Huntington’s disease. Stem Cell Res. 2012;9(2):143–155.